If you’re dreaming of loosing a few pounds but dread the idea of surgery, there are many non-invasive fat reduction procedures that can help. The body has certain problematic areas — the tummy, thighs, neck, upper arms, and love handles — where fat can be difficult to loose through regular diet and exercise. Using a wide range of techniques, including lasers and extreme cold, non-invasive fat reduction options can leave you with a slimmer figure. Here are a few of the things to consider when deciding if the non-invasive route is right for you. Unlike liposuction, tummy tucks, and other plastic surgery procedures, all of these non-invasive treatments can be performed relatively quickly, with minimal downtime, and no subsequent recovery period involved. While they only involve minimal discomfort and can generally be performed over the course of a lunch break, non-surgical treatments aren’t all suitable for every body part, nor are they as long-lasting as cosmetic procedures performed by a board-certified plastic surgeon. Furthermore, they typically require repeat treatment for best results. Although there are a few known side effects associated with these techniques, almost all of them come with significantly lower risk than your typical surgical procedure. While some non-invasive body shaping procedures can cause pain, most patients report minimal discomfort overall. Since none of these techniques require the use of anesthesia or an incision, they promise almost little to no recovery time. Zerona, officially called Zerona Z-6, is a specially designed, non-invasive body contouring technique that utilizes a laser to emulsify adipose tissue. Patients must undergo six painless 20-minute treatments wherein the cold laser dissolves fat cells and membranes while leaving other cells intact. According to Zerona, the average patient loses approximately 3.6 inches from the circumference of the waist, hips, and thighs. With this being said, studies show that patients regained an average of 0.31 inches across their waists, hips, and thighs following Zerona. The method was proven through a double-blind, placebo-controlled study. There are very few known side effects associated with Zerona, and the treatment has been FDA-approved since 2010. Candidates: Zerona is a good fat reduction treatment for those who have particular problem areas but are not significantly overweight. Patients must be willing to undergo a strict diet both before and after treatment. Cost: Ranges from approximately $1,500 to $1,700 for all six treatments. If you’ve ever fantasized about freezing off your body fat, then you’re in luck. CoolSculpting is the world’s top non-invasive fat reduction procedure, and the only FDA-cleared non-surgical procedure that uses controlled cooling to eliminate fat. Through a technique called cryolipolysis, CoolSculpting reduces fat cells to a temperature of roughly 39°F (4°C) in order to crystallize and then kill them. Over time, the body processes and eliminates the dead cells. CoolSculpting requires no surgery, anesthesia, needles, invasive techniques, or downtime. Most patients will require several treatment sessions with CoolSculpting, but it’s not impossible to achieve the desired final result in a single session. The side effects of CoolSculpting include swelling, temporary redness, bruising, tingling, cramping, aching, and itching, but most potential complications are considered mild and temporary. Candidates: You’re a good candidate for CoolSculpting if you have trouble losing weight in the lower abdomen, inner thighs, outer thighs, chin, or love handles (also called the flank or muffin top). You should also be within 30 pounds of your ideal weight before having CoolSculpting done. SculpSure, from Cynosure, Inc. is the world’s first FDA-cleared laser treatment for removing fat deposits from the abdomen, flanks, back, inner thighs, and outer thighs. Using a light-based technology, SculpSure promises to remove unwanted fat via controlled hyperthermic fat reduction over a short series of 25-minute procedures. According to Cynosure, SculpSure clients typically see results in the designated treatment area within six to 12 weeks. The post-treatment recovery period for this non-invasive procedure is essentially nonexistent, with patients able to return to their normal activities and exercise routines immediately. SculpSure does have several known side effects, including redness, bruising, tenderness, itching, bleeding, and swelling. Candidates: SculpSure is a body contouring procedure, so it’s not recommended for those seeking significant weight loss. This is one of the fat removal procedures most often recommended for those who desire skin tightening, sculpting, and defining. Cost: Ranges from approximately $1,200 to $1,500 for each area of the body. truSculpt 3D by Cutera is similar to SculpSure and CoolSculpting in that it uses controlled temperature techniques and radiofrequency energy to initiate fat loss. This procedure offers body sculpting and circumferential reduction using therapeutic temperatures to dissolve the adipose tissue. As truSculpt offers two unique hand piece tools, it can be used to treat both smaller and larger areas of the body. According to the manufacturer, truSculpt is a good choice for those with trouble spots and visible fat bulges in areas like the abdomen and flanks. Most patients realize the final results of truSculpt in roughly three months’ time, with visible improvements measured after just a few weeks. Most patients experience mild redness, sweating, and tenderness near the treatment area following a truSculpt treatment, but side effects are usually resolved in a few days or less. Candidates: truSculpt can be a good option for candidates who have a BMI of less than 30 and stubborn fat tissue in the abdomen, back, love handles, and other parts of the body. Those with a healthy lifestyle are the best candidates and will see the most lasting, dramatic results. Cost: Ranges from $300 for a single treatment to over $3,200 for complex applications. Vanquish is specifically designed for those who want to get rid of frustrating belly fat. If that stubborn fat layer at your abdomen still causes you trouble no matter how much you’ve dieted or exercised, then Vanquish is one of the best body treatments out there. This unique waist circumference reduction procedure uses radiofrequency technology and a low-level laser to destroy the fat cells. In general, it requires four to six treatments to lose approximately 2 to 4 inches from the waist. This non-invasive reduction option tends to produce fewer side effects than others and be more comfortable for those with all skin types. 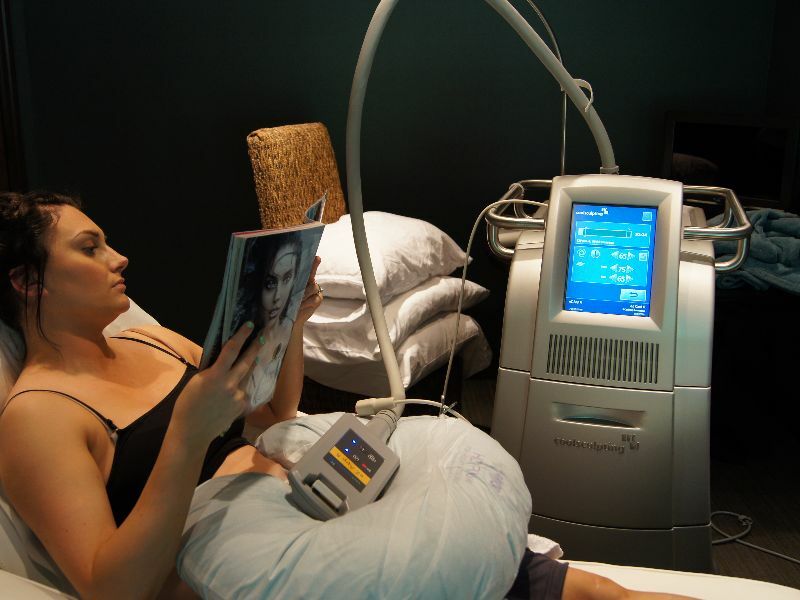 In fact, some people claim that Vanquish treatments feel like sitting under a warm blanket for a half an hour. Candidates: Unlike many other non-invasive weight loss treatment options, Vanquish is limited to the belly and abdomen area. It is not recommended for those who want to address excess fat in the chin, arms or thighs. However, Vanquish can cover larger areas, such as the tummy and waist simultaneously, with each treatment. Cost: Approximately $500 per session, ranging from roughly $2,000 to $3,000 in total. Liposonix claims to reduce your size in a single one hour non-invasive treatment, and that makes it very appealing to many people. This safe, non-surgical method uses high-intensity, focused ultrasound energy to zap away fat in the abdomen and love handles. According to the company, 91.3% of patients reported that their abdomen was flatter after a single treatment. Liposonix treatment includes Custom Contouring, which treats certain areas of fat for a customized approach to fat removal. It also utilizes high-intensity focused ultrasound energy (HIFU) to destroy subcutaneous fat without harming the skin or surrounding tissues. Mild side effects include pain, swelling, redness and bruising. Candidates: Liposonix is not for everyone. The company recommends the treatment for those who have unwanted fat around the waistline that won’t go away with diet and exercise alone. Those in overall good health with approximately one inch of fat in the treatment area and a BMI equal to or less than 30 are considered good candidates for Liposonix. Cost: According to Smart Beauty Guide, the average cost for Liposonix treatment ranges from $1,500 to $3,000, per session.